Our patented Rejuvenation process will restore your synthetic court to its former glory. 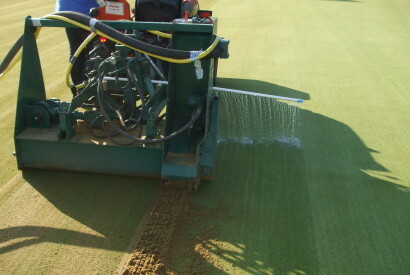 The rejuvenation process will restore your synthetic surface to as good as new. The surface is swept clean of all unwanted contaminates and debris. 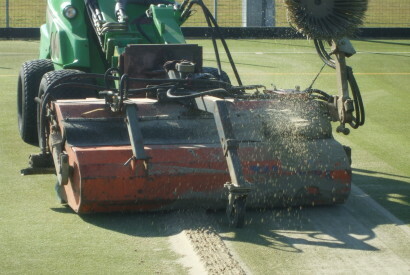 Our patented rejuvenation machine dampens the contaminated and compacted sand infill, then it delivers a carefully balanced mixture of compressed air into the carpet pile, forcing the contaminated and compacted material to the surface ready for disposal. The extracted infill material is then removed by our specialised sweeping unit and moved of off site. The sweeping unit simultaneously brushes the pile fibre back into the upright position. 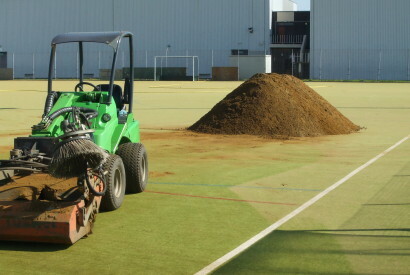 The contaminated sand can be re used as top dressing on natural grass or disposed of. During the rejuvenation process the bottom of the carpet pile is agitated and decomposed restoring the drainage of the carpet back to its original condition. We refill the synthetic surface with new silica sand to the correct levels, breathing new life into your sports carpet for years to come.